I had been trying to practice the notion of pronoia, which I heard on The Duncan Trussell Family Hour podcast. It’s the notion that the universe is out to help you along, instead of out to hurt you. As I looked around, I could see the spot where I had camped for the previous nine years and where I typically parked within feet of my car. Directly to my left, my car was blocking the path of Wayne’s car, a longtime volunteer. A pump was pulling water from the driving path and into the creek rushing downstream. Little did I know that just three days before there was three feet of water – literally enough to kayak through, as the photos later proved, where me and my car were baking in the sun. One of my fellow campers, Jim, came over and tried to push The Silver Hornet out of the mud to no avail. Once I got my car pulled out of the mud, I camped on higher ground and listened to the Phillies game on the radio in a humid tent hoping my 10th Philadelphia Folk Festival could only get better. 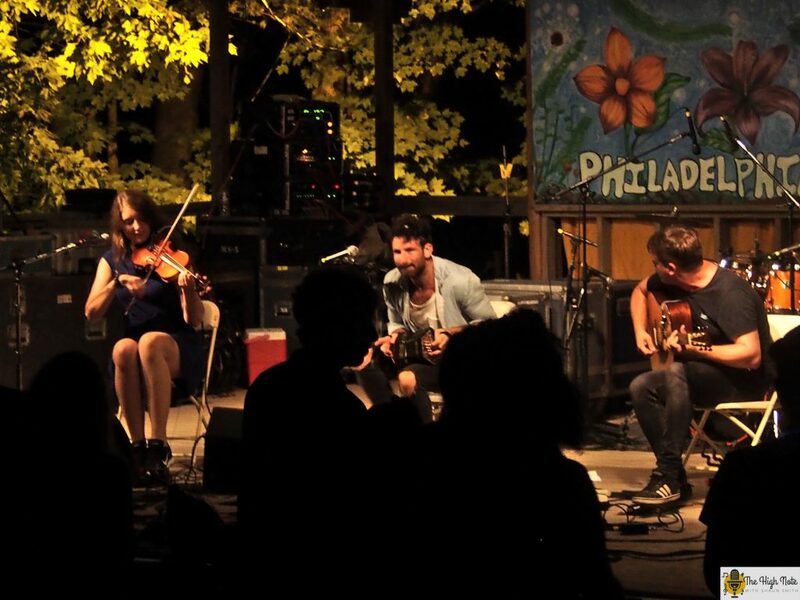 Toronzo Cannon performs for campers on Thursday night of the 57th annual Philadelphia Folk Festival. The next morning I awoke to the sound of Wayne’s tires spinning in mud. I walked over to see if he needed a hand but he decided he didn’t need a Wawa coffee that bad. As we were chatting, Paul, who lived nearby and was riding his bike looking for a dry place to camp. He had seen the kayaking photos. I took a look at the The National Weather Service’s nearby flood stage gage. It had gone down from 11 feet to 3 feet over the course of 36 hours. After some weather forecasting and solid guesswork, we decided on a spot near where I had set up with his car close to the road to make a quick getaway. Since I had rented a bike for the weekend and didn’t bring a lock, helmet or light, I asked to borrow his lock to ride to Wawa and we decided we could lock our bikes together for the Thursday night concert. When we got to the gate, I was happy I wore a pair of duck boots that have been kicking around for decades and were about to get their most use since hurricane Sandy. I turned to one of the volunteers and pointed to where I knew the press check-in was located but I had to ask him anyway – “Do I have to go through there for press?” We looked down and our eyes met. WXPN “World Café” host David Dye always brings a solid lineup of performers for the Thursday night concert which is only for campers. In years past bands like Sturgill Simpson and The National Reserve have almost had the crowd jump on stage in excitement. Gina Chavez opened the 57th annual Philadelphia Folk Festival with her Latin-infused folk rock that brought the campers down from the campground in droves. Thousands cohabitate in an area that covers more than half of the 40 acres of the Old Pool Farm, that is a working farm for most of the year. Scottish folk trio Talisk set the hill on fire soon after the first note. Mohsen Amini played the concertina with an ancient ethereal spirit that pulsated throughout his body; melding earth and sky like a spidering bolt of lightning. Joined by bandmates Hayley Keenan on fiddle and guitarist Graeme Armstrong, the field was alive with stamping, twirling and cellular glow. From the moment Talisk hit the stage, the crowd, which now extended all the way up to the security gate at the top of the hill, surged forward. As I stood next to the stage, I waited for the heads up from security so I could dive onto the ground in the pit to take photos from in front the stage without getting trampled. 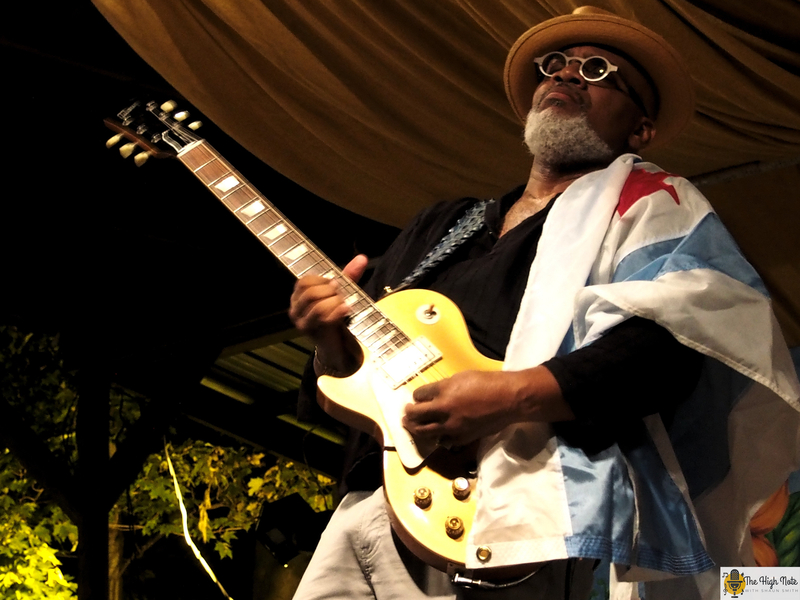 Chicago blues guitarist Toronzo Cannon hit the stage with a flying-V guitar and rode a wave of energy over the crowd. I now understand those black and white videos of young ladies fainting with each sway of Elvis’ hips after I watched a wave of people nearly fall to their knees when Cannon played the guitar with his teeth. With each leap and strut the crowd stamped, danced and tried to hold on to the sheer force that Cannon emanated from his guitar. With each note, he drove a deeper groove into the hillside. He wasn’t phased when some helpful inebriant informed him from the side of the stage that Aretha Franklin had died – like a festival crier. Somewhere around the pit of photographers, I saw seasoned festival photographer Lisa, who was shooting away from the center of the pit. After Cannon finished his encore and was carried offstage with a standing ovation, I managed to find both Paul and Lisa on the hillside. “Do you have any tips on how to be a better photographer,” I asked her. “Go everywhere you’re not supposed to go,” Lisa replied. Paul and I were buzzing on the long and muddy walk back to the front gate where our bikes were parked. 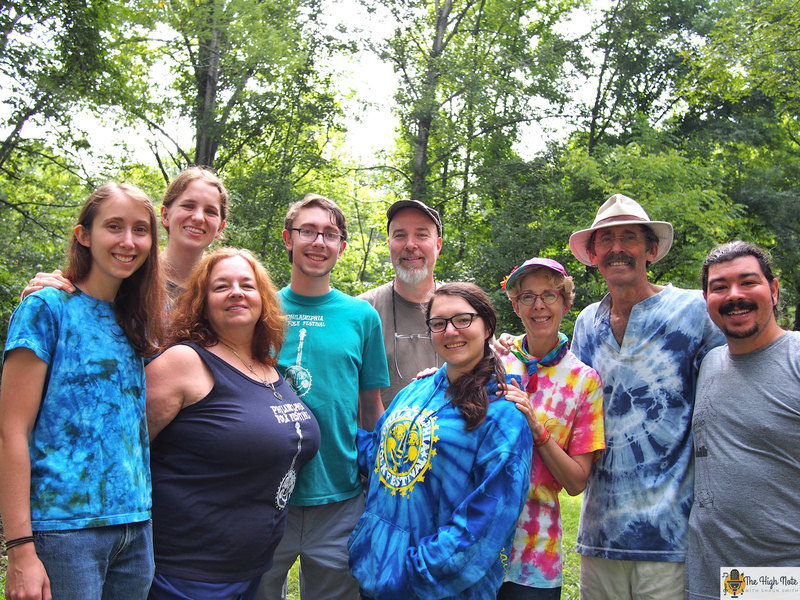 By the time we got back to the campsite, most of my fest family was set up – Bert, Laurel, Loraine, Jessica, Amy and Lauren. Bert’s car was stuck but Amy’s car, Elmer, wasn’t. It would have to wait until the morning. 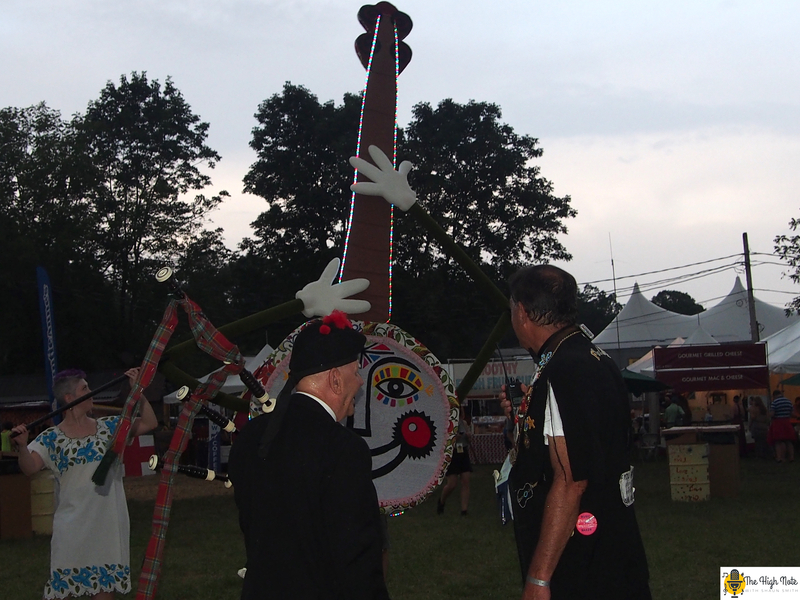 Dennis Hangey inspects Jo the Smiling Banjo at the 57th annual Philadelphia Folk Festival. Using a system of jacks, miscellaneous piece of wood including two-by-fours and fallen tree branches, rocks, physical strength and the will of a man who has gotten himself stuck and come hell or high water will get himself unstuck, Bert got his car out of the mud in time to pick up our final camper, Ben, from the train station. Jessica, Amy and Lauren went to the creek to wash off the mud that was left from Bert’s tires. Then, we hung out around camp for most of Friday, which is actually a hard temptation to resist at fest. One friend from South Jersey who I happened to see while he was leaving the festival this year, Bill, told me he didn’t leave the campground the entire weekend one year. I really could have stayed there all day and listen to Paul play bluegrass on his guitar. 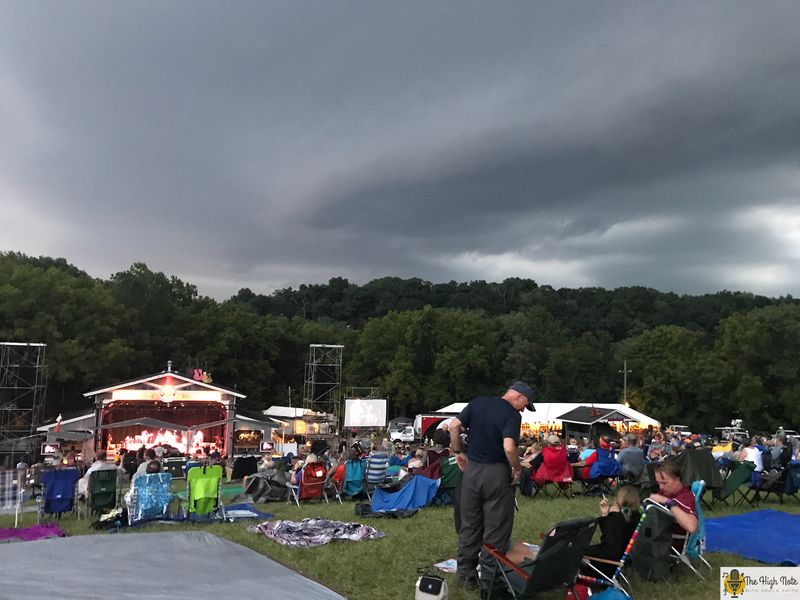 Since Lisa is both a better photographer and a better fester than I am, I asked where she was going to hide out as the storm was closing in on the festival grounds. She said the hospitality tent next to the main stage had held tough in the strongest of storms that have blown over the festival throughout the years. 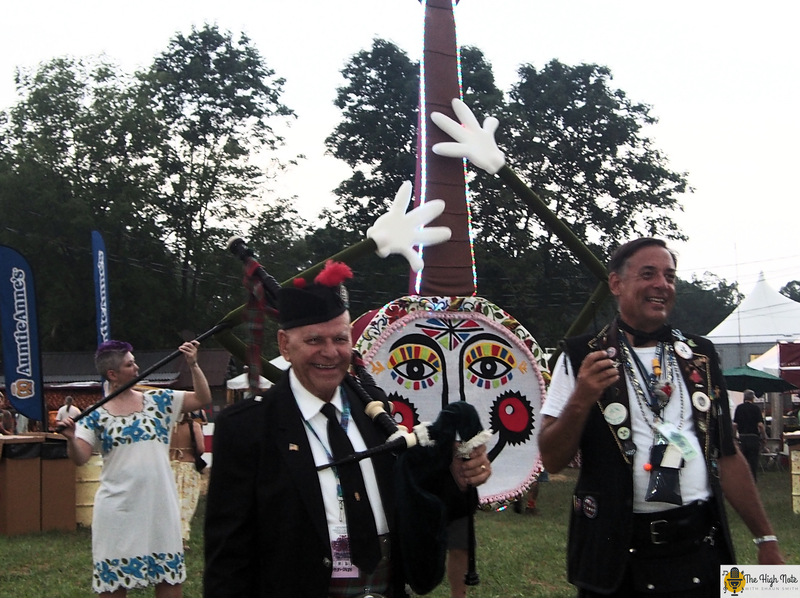 I was hanging out with legendary bagpiper Dennis Hangey who opens up the festival each evening of the festival year after year while the rain fell. He continued to pose for photos with festival goers while he waited for the OK to begin playing and marching down the hill toward the stage. “Now I’ve heard everything,” his fellow bagpiper replied through the radio. Dennis Hangey beings the 57th annual Philadelphia Folk Festival with Jo the Smiling Banjo. Not long after Emcee Gene Shay announced the first band, Skerryvore, would soon take the stake, he said that everyone should either leave to secure their campsites or go find a place to hide out as the festival was going to be paused due to an impending thunderstorm. A herd of photographers, reporters, artists and Friends of the Festival stampeded to toward the tent. Bryce, who Lisa brought to experience his first folk festival, took one look at the tent that was now swelling with excitement and sweaty people and looked at us. “Do you guys want to get a beer?” We nodded in agreement. We got to the Yards Brewing Company beer tent before the heavy rain started and while waves of lightning shot sparks over the mountains in the distance. Surprisingly it wasn’t that crowded. The beer tent is a microcosm of the festival. It is where interesting people go to quench their thirst for fun and excitement or to get out of the sun while they are up on the hill. It’s a combination of wishing well and watering hole for a festival reporter and has been a gift that continues to provide colorful stories. 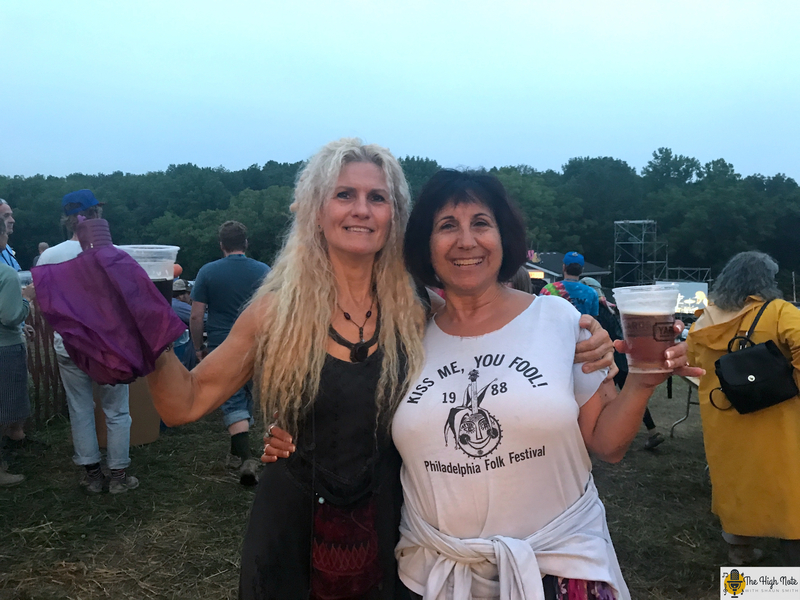 While I was there I saw Philadelphia Folk Festival and Folksong Society Programming Director Lisa Schwartz who was checking on everyone while the weather continued to make the view from the tent seem like standing behind a waterfall. Dark clouds hang over the Martin Guitar Main Stage at the 57th annual Philadelphia Folk Festival. She let me know that the festival would begin 30 minutes after the last lightning strike. She shot down my idea to pass the hat to help pay any violations against the township noise ordinance. She also introduced me to a past volunteer named Alex. Within a couple of minutes, we realized that while he grew up down the street from The Old Pool Farm and had been attending the festival for about 30 years. Oh, by the way I grew up with his cousin in Atlantic City. Oh how the festival family continues to grow. After beers and new friends, the Scottish band Skerryvore hit the stage for the third time. The cowboy revival band Riders in the Sky. This quartet of folksy characters was full of song and story, slapstick and in their case, slap-face and with a range to please children and college students. Drained from what was beginning to be a long weekend, I was drinking coffee in the hospitality tent when I got to hang with some of my photographer friends – Lisa, Bryce and Randy, as we waited and talked gear between sets. While the rain held off for most of the evening performers, it picked up again as David Bromberg Quintet hit the stage, which was my cue to take a rainy bike ride back to camp. David Myles performs at the 57th annual Philadelphia Folk Festival. The Lower Frederick Fire Company Pancake Break-Fest is one of the highlights of the festival. 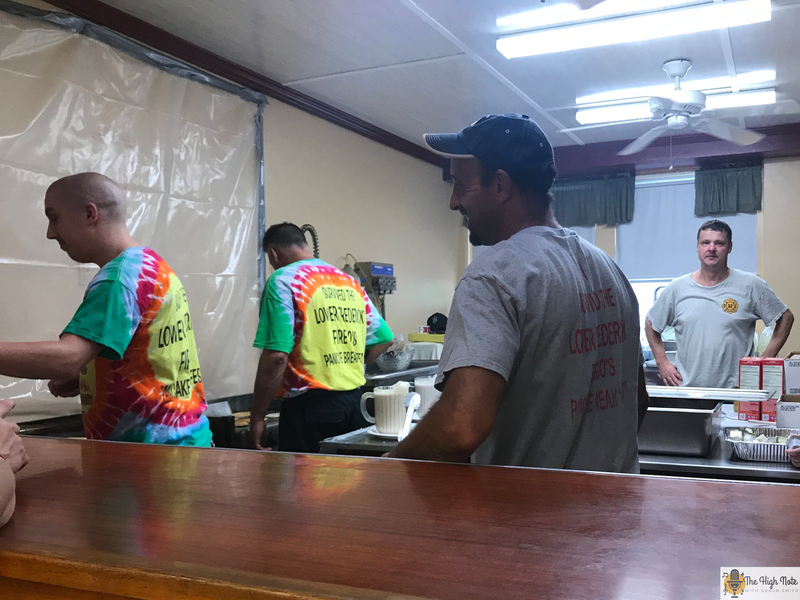 Thousands of pancakes and sausage links are slung through the kitchen of the social hall from 7 a.m.-noon, Saturday and Sunday of every folk festival. Campers come by the wagon-full pulled by a tractor for an all-you-can-eat breakfast that also includes coffee, and orange juice for $7 – which is one of the best experiences of the festival. I didn’t get back to camp before I got a phone call from Halifax, Nova Scotia, Canada. 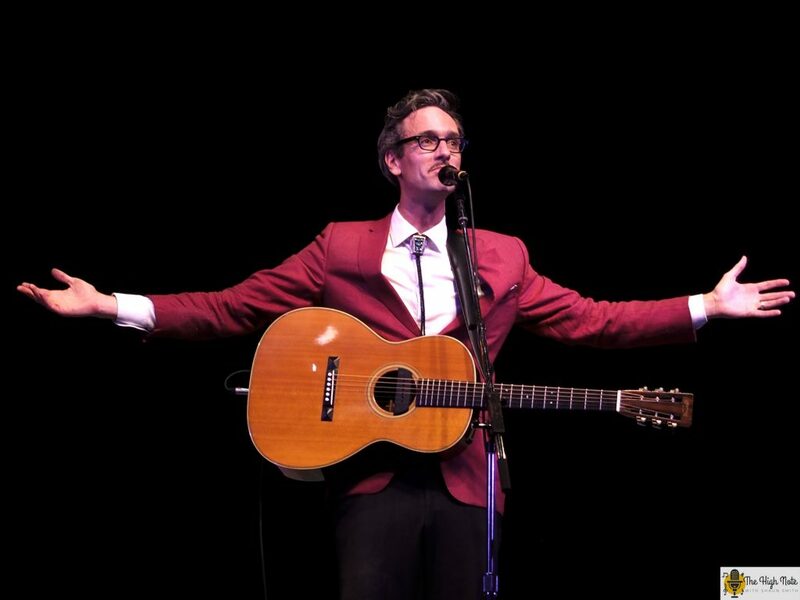 As luck would have it, it was the booking agent for David Myles looking to coordinate an interview with The High Note before his “Northern Lights” workshop on the Craft Stage. While I was walking through the preferred parking lot on the way to my interview, I saw a Lenny’s Towing and Auto Service truck pulling a vehicle onto the flatbed while another was waiting to an unstuck a car out of the muddy patches that, like cosmic cow patties, laid in wait throughout the fields that served as festival parking for the weekend. I had a fantastic 30-minute interview with Myles. We chatted in the hospitality tent like a couple of old chums talking Hockey Night in Canada Hot Stove over a couple of black coffees and maple dips at Tim Hortons. After Myles’ set, I got a chance to check out NOLA Tango with Honey Island Swamp Band and Hip Harp – with lyricist and rapper Kuf Knotz and harpist Christine Elise. While Myles was signing autographs I got to take his photo with Jessica. 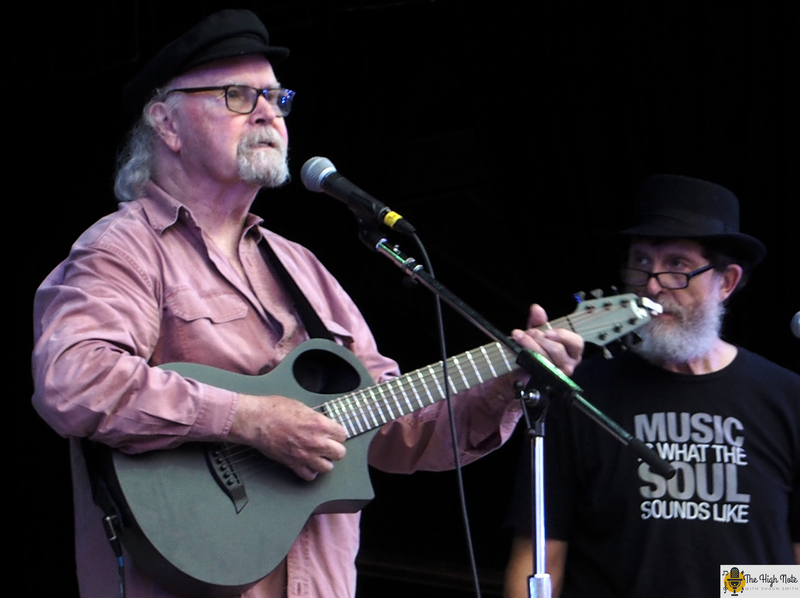 Tom Paxton performs at the 57th annual Philadelphia Folk Festival. I made sure I was in the photo pit for Tom Paxton and the DonJuans. I wandered up the Lobby Tent to shoot some Contra-dancing and then got to see Myles perform on the main stage. With his second performance of the weekend and his second year at fest, he captivated the audience with his charm, classic rock ‘n’ roll style and heartfelt songwriting. Valerie June won the festival over with her whimsical, mythological approach to her set to close out Saturday night. 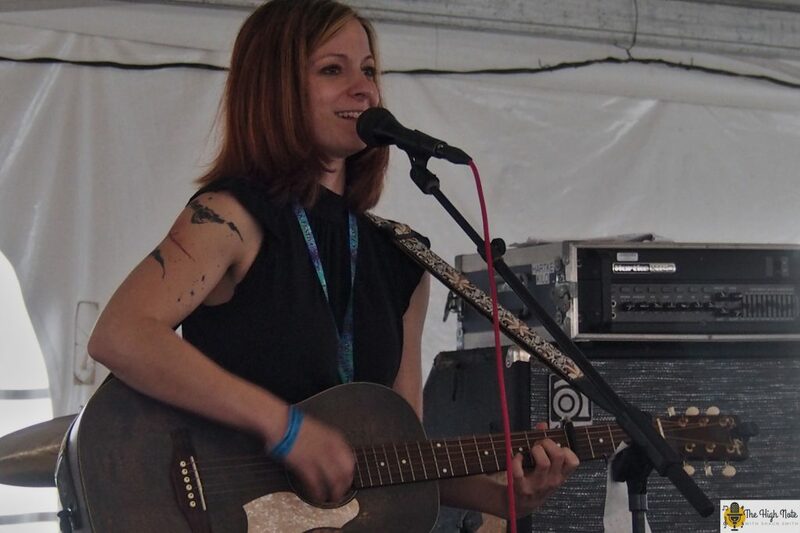 Renee Wahl performs in the Culture Tent at the 57th annual Philadelphia Folk Festival. Sunday morning at folk fest always comes with a hangover of undersleep and overexcitement. I also knew that I still didn’t have a solid story for the festival. For past festivals, I had published a story each day, recorded interviews in the beer tent and brought my notebook to Dulcimer Grove. I decided this year to document my journey and perhaps try to find the person who had been coming to fest the longest. I put my boots on and headed to the pancake breakfast to build up a solid foundation of carbohydrates and sodium for my final day of fest. Waiting in line I found another friend, Kim, who owns a flower shop back home. 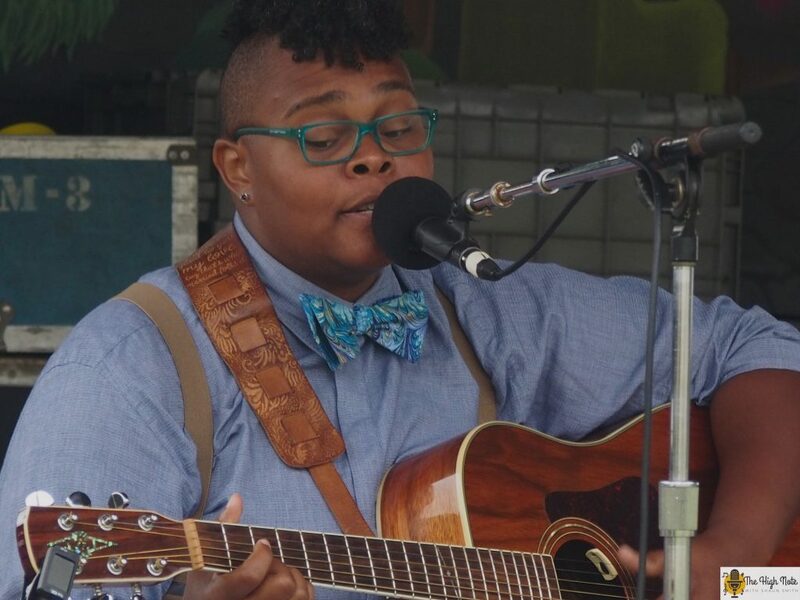 As I ate pancakes, drank coffee and scrolled the Sunday lineup on my phone, I connected with singer-songwriter Crys Matthews, who happened to be performing with Myles and Dana Sipos for the Quirky Folk workshop. With a light rain falling, I took another bike ride for my final day of folk. 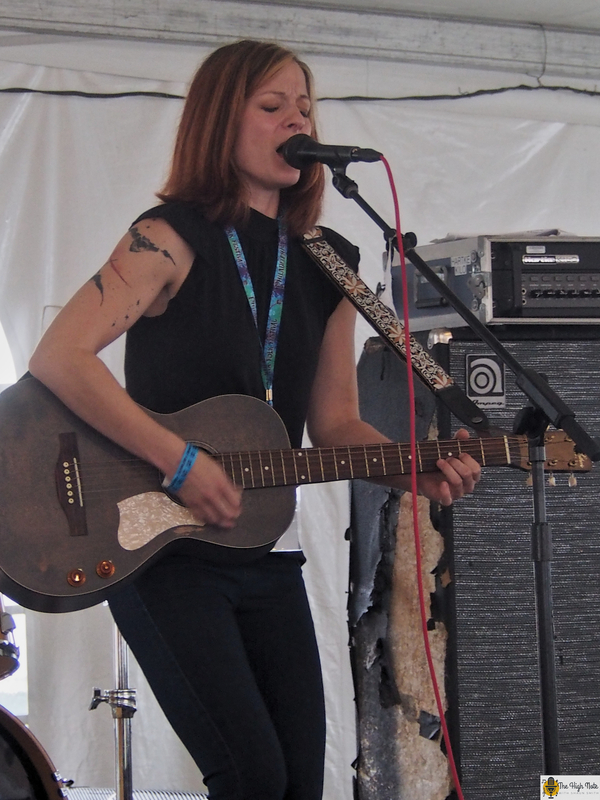 Crys Matthews performs on the Tank Stage at the 57th annual Philadelphia Folk Festival. I stuck around after that wonderful workshop and heard the beginning of the Nashville Song Circle workshop featuring Renèe Wahl. She opened with “Six Days til Sunday,” a song she said reminded her how it feels the Monday after fest. The beer tent on Sunday afternoon wasn’t that crowded. A couple of people were hanging out eating and drinking. With ample tables available, I got a chance to take off my bag and charge my phone. I started talking with Ed, who works for Yards. The conversation quickly turned to podcasts and how Drink Champs is better than The J.J. Reddick Podcast because of the authenticity, even though we both love both Reddick and the Sixers. I decided to move spots across the tent and started talking to Wahl and her drummer David Strayer. They were hanging out and waiting to perform a workshop after Daniels – From Air Force to Airwaves with Renèe Wahl and the Sworn Secrets. Originally from Philadelphia, Wahl graduated from Temple University before joining the U.S. Air Force. She managed to land her final assignment in Nashville, Tennessee. 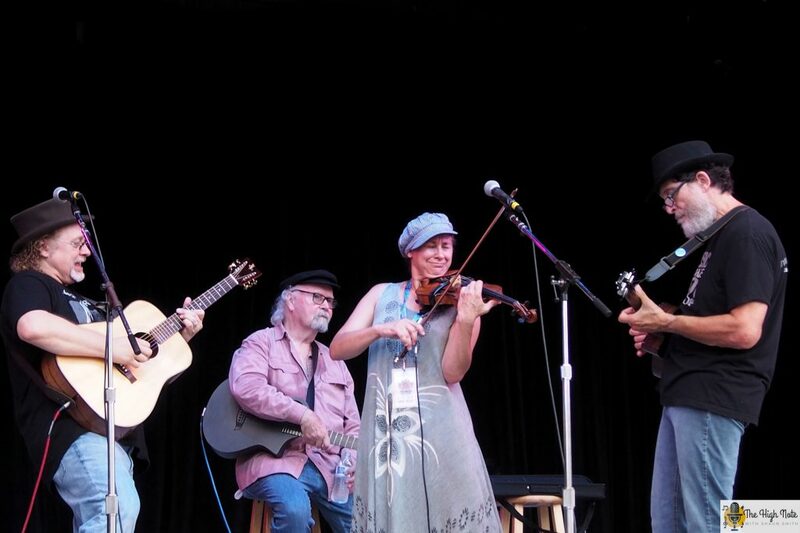 Renee Wahl performs at the 57th annual Philadelphia Folk Festival. We finished our beers and walked over to see Daniels. We were faced with a horde of folkies lounging around waiting for Daniels to take the Culture Tent stage near the front gate. Your author with Gandalf Murphy of the Grand Slambovian Circus Of Dreams. 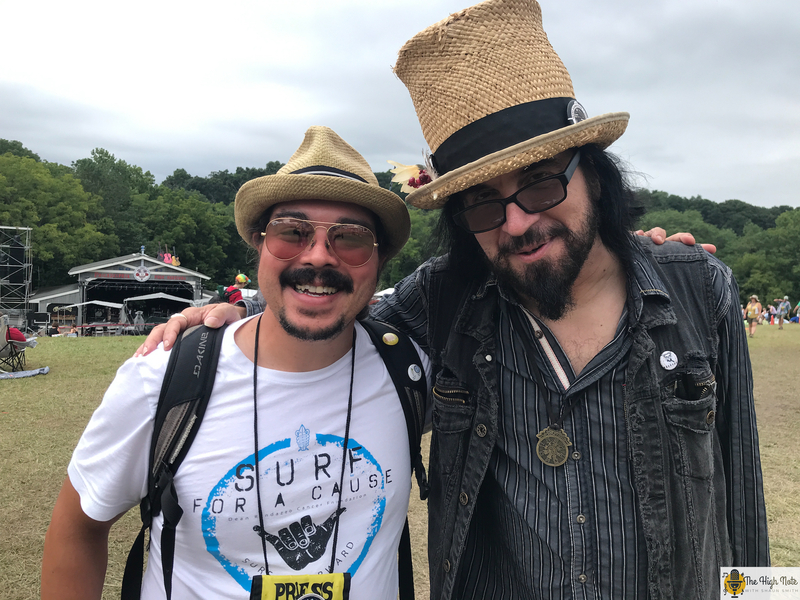 I wandered around the festival where I ran into Kuf Knoz and Elise and also got to meet Gandalf Murphy of the Slambovian Circus of Dreams. Wahl and Strayer played a thundering set in the Culture Tent to a fabulous crowd that followed intently on every note and word. Wahl’s combination of gritty blues-influenced rock ‘n’ roll and intimate songwriting intrigued and embraced the captive audience. When Wahl finished I wandered over to the Lobby Tent to catch a dance party featuring West Philadelphia Orchestra, one of my previous festival favorite finds. I ran down to the photographer pit just as Jeff Daniels and The Ben Daniels Band took the stage. I know that Daniels has been acting in movies for as long as I have been alive, but his stage presence completely won me over. 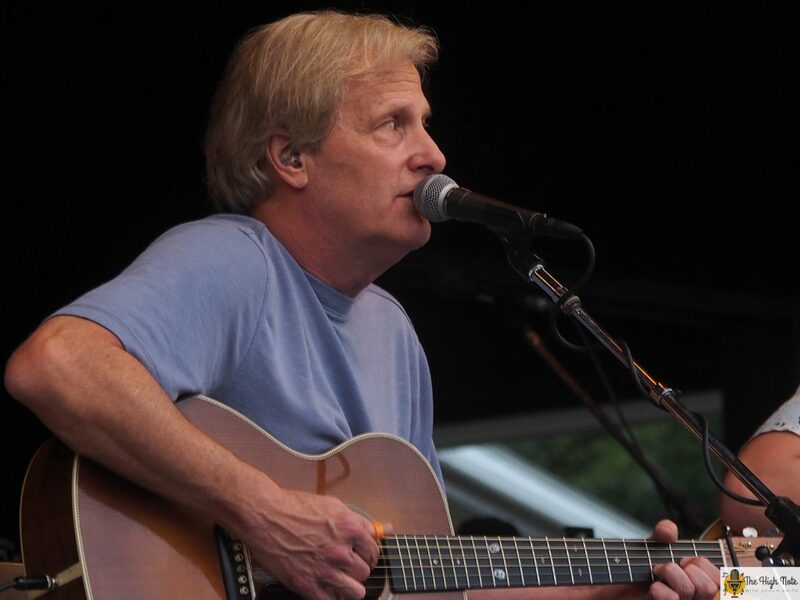 Jeff Daniels performs with the Ben Daniels Band at the 57th annual Philadelphia Folk Festival. Standing by the side of the stage, leaning up against the lighting support as the rain fell in a consistent shower, I felt like Daniels was welcoming me onto his porch in Michigan to listen to him and his family sing songs and drink beers. To duck out of the rain and to use up the last of my beer tickets, I ducked back into the beer tent where I ran into Alex, once again. I got to meet his mom Leeann and also some new friends who were trying to get the most out of the last of fest. One of them was wearing a shirt from 1988 and had been coming since long before then. Before we knew it, we were buying beers and swapping stories like we were at all long last reunited. Just outside the beer tent I Alex introduced me to his brother Andrew, who I know and you may as well know as the guy who sets up his full drum kit in the road in the campground during fest. My fest family continued to grow. Wynonna and The Big Noise closed out the festival with a thrilling set of revved up southern rock. With an old soul style and an engine powered by Wynonna Judd’s large voice, The Big Noise left the stage as the crowd was leaping to their feet. During such a wet weekend with some late nights, my camping buddies didn’t have the heart to light a fire at all up until that point. Still hungry for more music and packs of unopened hotdogs, we headed back to camp. Using a headlamp as my guide, I rode back to my campsite along the Perkiomen Trail, a beautiful path that is covered by a canopy of trees along the Perkiomen Creek. It runs 20 miles on the rail bed of the Perkiomen Line of the Reading Railroad Trail. Big float around at the 57th annual Philadelphia Folk Festival. It spits riders out at the local watering hole, Joe’s Spring Mount Hotel, where I nearly instinctively rode right into before steering myself back onto the trail as it turned downhill toward the main road. In the distance, I could see a car slowing toward the stop sign that I was speeding toward. The rented Raleigh mountain bike I was on had brakes that had been acting as a horn all weekend, except now that they were wet, silent and squishy. With a little too much pressure on the front brake, I managed to achieve liftoff, walk on air and somehow completely clear the handlebars, landing with my left foot on the ground, then my right foot, and I finished my dismount with a short jog down the bottom of the hill. I looked around in the silence of the night as what seemed a thick mist hung in the air. In the yellow light of the bar parking lot, I saw nothing but stillness. I looked back and saw the car had stopped 20 feet before the stop sign. I threw my arms up in triumph. Survival of the savvy. Thumbs up. “I’m OK” I shouted in the direction of the car. I jogged back up the hill and retrieved my twisted metal steed. I hustled down the hill holding onto the handlebars, giddy with a new lease on life. “Do you know how to get to 29,” asked a voice from inside the darkness. I burst into laughter as I jogged across the street, hopped back on my bike and rode back to camp. “Renèe Wahl, hands down,” I said. With guitars, ukuleles, songbooks, beers and hotdogs, we sat around the fire and sung songs until 3 a.m. and tried to keep the festival vibes alive like the embers in our smoldering fire. 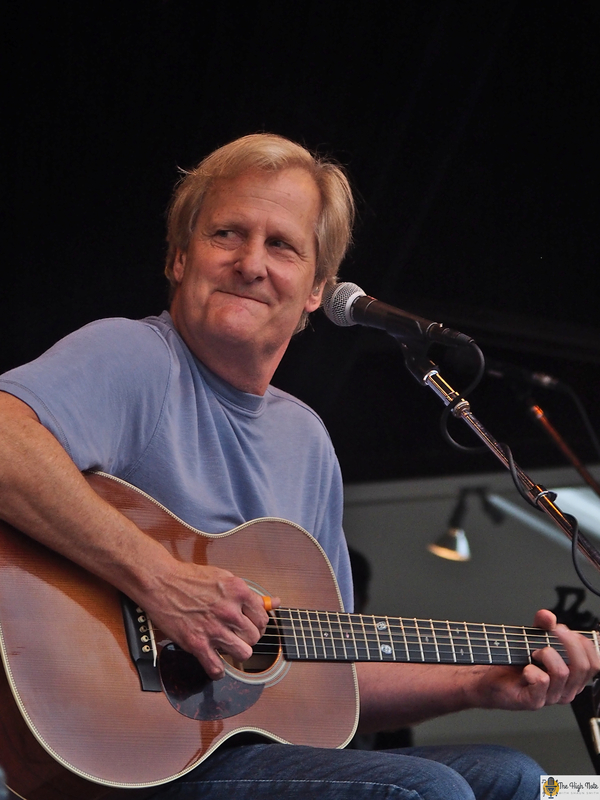 Jeff Daniels performs at the 57th annual Philadelphia Folk Festival. One thing I’ve learned over the years is that I need to bring a tripod for our group photo Monday morning. By the time we get around to waking up and breaking down, we rush to find something or someone to take a quick snap. With a program and a fest family photo, the 57th annual Philadelphia Folk Festival was officially documented. As I steered my car back toward the beach, I popped Jess’ Folk Fest Favorites, a mix of her favorite performers over the years into the car CD player. 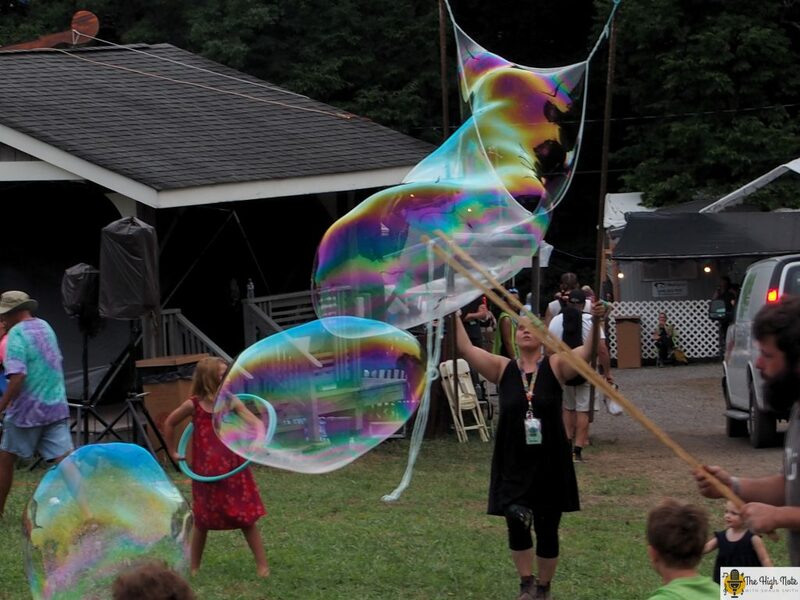 As each track and mile marker passed, another memory flew by over 10 Folk Fests. And that’s only 10- nothing compared to the people who all they ever knew was fest, whose pregnant mothers carried them along and looked after them for years until they started going by themselves, for the people who have tattoos of the banjo logo, for the people who boots and bells is a way of life, and more things about fest that I haven’t even begun to understand. Maybe it’s the festival that finds people, brings them together for a good time and watches over them for a sacred weekend in August each year. Just two days later, the area would flood once again with a foot of water swallowing the bench where we sang songs Sunday night.